APC Magazine has listed MC Helper as one of the best Windows Phone apps! MC Helper is an extraordinary reference guide for the constantly evolving game of Minecraft. 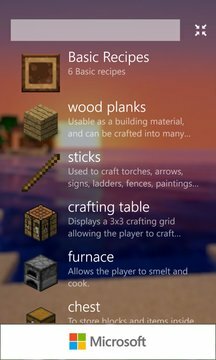 With more than 15 video guides, a comprehensive list of 500+ data values, and every crafting recipe, there is enough information for even experienced Minecraft players to use MC Helper as a resource. 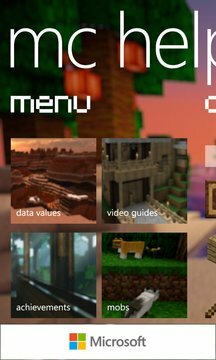 Use MC Helper as a companion app to learn more about various Minecraft materials including achievements, biomes, blocks, commands, crafting recipes, and mobs. We have even added YouTube video links to the block, crafting and mob pages to further assist you with Minecraft. Minecraft content and materials are trademarks and copyrights of Mojang AB or its licensors. All rights reserved. This application is a part of Coconut Storm and is not affiliated with Mojang AB.